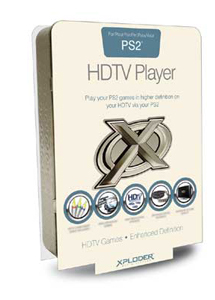 Xploder HDTV Game Player Will Upscale PS2 Games, Right Now (Sort Of) | OhGizmo! By David Ponce on 08/01/06 • Leave a comment! We’re not too sure we like the idea of upscaling your video signal to HD standards, but that hasn’t stopped several DVD manufacturers from using the technique to make the image look a little better. And even though the PS3 will allegedly also upscale all PS1 and PS2 games when it is released, you don’t have to wait until then to do so yourself. With the Xploder HDTV Game Upscaler, you can take your current PS2 game signal, and display in standard 480p, or upscale to 720p/1080i Hi-Def video. The settings are then saved to your PS2 Memory Card. There is no word on pricing and availability.